Communities across the country can bid for up to £50,000 to help make local areas more attractive for business, High Streets Minister Jake Berry MP has today (24 January 2019) confirmed. The latest round of the £500,000 British Improvement Districts (BIDs) Loan Fund will support business owners and local leaders to set-up a BID, which allow communities to come together to deliver additional local services and upgrade commercial areas for the benefit of business. From Altrincham to Watford, Business Improvement Districts serve as a tried and tested model of how local business can work together to realise the potential of towns and high streets by engaging strategically with local authorities, developers and communities. "BIDs have a proven track record of upgrading commercial areas to enable business owners and entrepreneurs in our town centres and high streets to thrive. 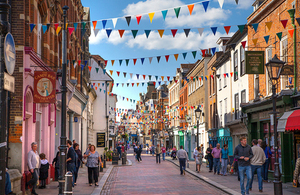 "Whether through promoting longer opening hours, more security for shops or pedestrianised shopping districts, BIDs are a go-to vehicle through which you can reimagine your high street or town centre. "Those on the ground know what works. Our Loan Fund is designed to provide them with the means to drive regeneration forward and meet local needs." British BIDs, a BIDs sector body, hold the contract of managing and operating the fund until September 2020. "Business Improvement Districts have been shown to be hugely successful in regenerating town centres. "There are now over 300 BIDs across the UK and the Loan Fund that the government set up has been vital in helping key BIDs to emerge. "Thus far 29 loans of between £10,000 and £50,000 have been allocated through the British BIDs application process, and BIDs have been able to use this loan funding to develop their proposals and support the ballot process." In July 2014, the Altrincham BID was awarded £40,000 from the 3rd round of the BIDs Loan Fund, which supported it to overcome prohibitive start-up costs during development. The BID was launched in April 2016 and supported Altrincham town leaders to take forward an ambitious plan to transform their historic market hall into a food and culture hub at the centre of the town. This bold vision paid off, turning around a shop vacancy rate of 30%, one of the highest shop vacancy rates in the UK. Last year the town scooped the prize for England’s best high street at the 2018 Great British High Street Awards. Altrincham was recognised for its “ongoing events throughout the year to drive footfall to the local high street”, which the town’s Business Improvement District Altrincham Unlimited has done much to lead. There is up to £95,000 available for this latest round of funding, which we estimate will be able to provide funding for up to 4 prospective BIDs. Successful applicants to the fund can receive up to £50,000. The average received by successful applicants has been £33,000. Expressions of Interest in the Loan Fund are to be received by 8 March 2019, with completed applications by 10 May 2019. For more information, please visit our BIDs Loan Fund page and the British BIDs website. To register your interest and receive an application form, please contact bidloanfund@britishbids.info.